We were surprised and impressed to hear that he, a conservative atheist, is married to a muslim member of the social democratic party, who is also member of parliament. He showed around stopping at some interesting pieces of art and leading us through the “Strolling Hall”. This hall was nothing but a backyard in former times and still has a transparent ceiling so that it is very bright. On their way out of the chamber members of parliament must walk through that hall, where they have to meet journalists and members of other parties. Next to that hall is a chamber where the German Reichskommissar Josef Terboven had his office during the occupation from 1940 to 1945. A person wanting to talk to that governor could have known whether the latter liked him or not by the distance he had to walk until he met him: If he had to walk all the way to the desk he could be sure that he was going to have a tough conversation. But if the governor did appreciate his visitor he would show by walking the full four steps to the middle of the room. After that we were shown a copy of the Norwegian constitution, which is the second oldest constitution in the world that is still in force and celebrates two centuries of existence this year. Despite the fact that it included racist paragraphs for instances banning Jews from Norway, it was a progressive and democratic constitution at its time. In the assembly hall, which is held in a Viking inspired, with carved wooden chairs and desks. The members of parliament are seated by region and not by party so that Stefan sits between two Social Democrats. The 169 MPs meet in an old and majestic room which is far from being christmassy. 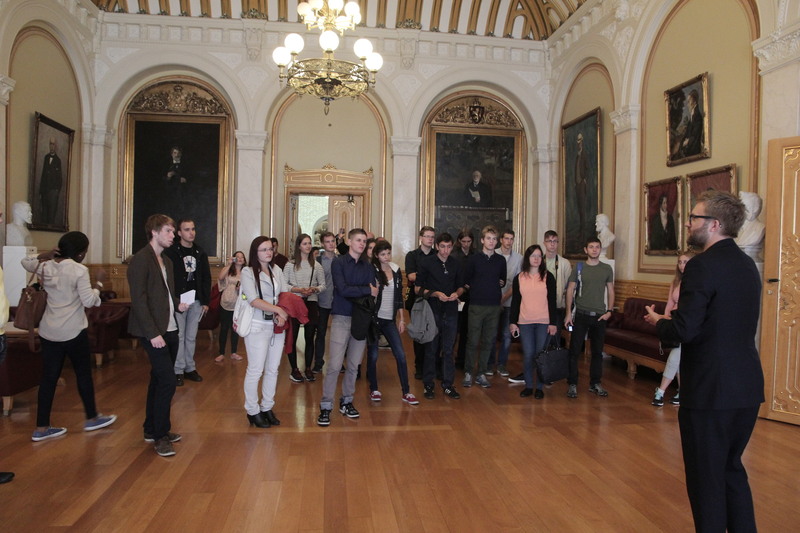 We then were lucky enough to be allowed to sit down in the room of the former second chamber. There we had a conversation on trust in (Norwegian) democracy. Stefan stated “trust works” and explained that there has been a long tradition of consensus in Norway when it comes to major decisions. Stefan raised two interesting questions: “Could there be a democracy without trust?” and “What would happen in a place where the citizens do not have trust in the government?” These were then controversially discussed. We left the parliaments happy with many new impressions and some ideas reconsidered. In the afternoon we simulated a meeting of the city council of the well-known town of Sleepyville. You can find a full report of the interesting experiment in another entry. 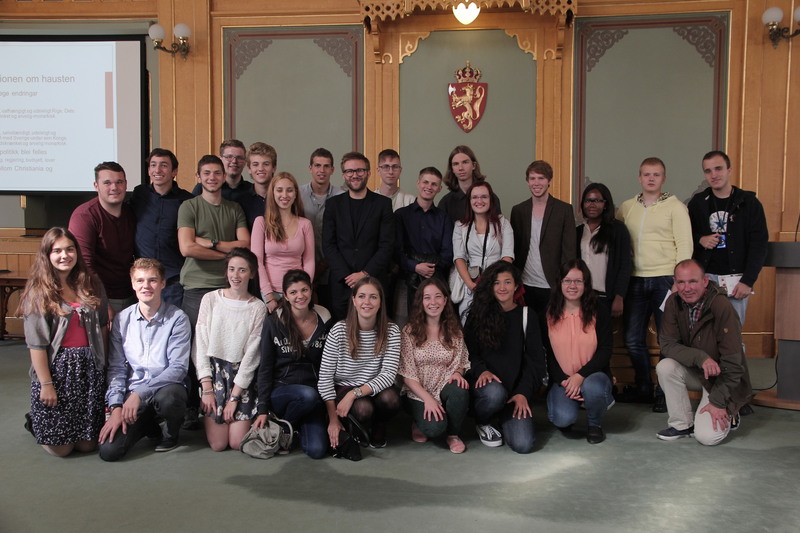 This entry was posted in History Camp Oslo 2014 and tagged democracy, parliament, Storting, trust. Bookmark the permalink.